There have been a number of advances in canine atopic dermatitis treatment within the past few years, notably the introduction of the janus kinase inhibitor Apoquel (oclacitinib), manufactured by Zoetis. While the shortage has been aggravating, Apoquel has proven safe and effective for the treatment of canine atopic dermatitis. Recently, Zoetis has conditionally released a new product to veterinary dermatologists that adds to the therapeutic options for one of veterinary medicine’s most common disorders. Currently, the product is called “Canine Atopic Dermatitis Immunotherapeutic” or CADI. It’s a once monthly subcutaneous injection for atopic dermatitis related pruritus that grew from the research that brought us Apoquel. Interleukin-31 is a cytokine associated with pruritus and inflammatory cell infiltration into the skin in humans and dogs with atopic dermatitis.¹ IL-31 is produced by activated Th2 lymphocytes and when signaled, binds to a heterodimeric receptor causing initiation of a signal transduction cascade. One of the components of this cascade is the janus kinase system, which is inhibited by oclacitinib. CADI is a canine monoclonal antibody that specifically targets IL-31, neutralizes it, and prevents binding of the receptor. This inhibits the entire cascade, which in turn decreases janus kinase–mediated itch. In essence, it works like oclacitinib, but earlier in the pathway and with more specificity. A single subcutaneous injection of CADI produces noticeable pruritus relief versus a placebo for up to 56 days.² Veterinary dermatologists are now exploring how CADI is accepted and incorporated into clinical practice. It’s not known when CADI will be more widely available. Hopefully, it will soon be another option veterinarians will have for managing canine atopic dermatitis. To take a quick look at the body locations commonly affected, the symptoms, and the types of lesions associated with each of these conditions, check out www.itchology.com. Itchology is the app for dedicated pet parents to mange their itchy dogs. Retrospective evaluation of Apoquel® (oclacitinib) for the treatment of atopic dermatitis. Part 2: monitoring for side effects. In September I reported on the effectiveness of Apoquel® (oclacitinib) in controlling pruritus (itch) in the first 117 dogs that I had treated with this newish medication from Zoetis. When I prescribe Apoquel, I recommend obtaining a baseline complete blood count (CBC), serum chemistry, and urinalysis, with examinations and additional monitoring scheduled at 3, 6 and 12 months. There is no specific guidance from Zoetis or the FDA concerning monitoring the long-term use of Apoquel. This is the level of monitoring that I would do for my own dog taking this new drug, given that it modulates the immune system. Each veterinary practitioner will recommend what they are comfortable with and this may be influenced by experiences (positive or negative) and will likely evolve over time. I selected several laboratory parameters to analyze over a 6-month period for 66 dogs. Note that this is not a rigorous clinical trial and may well suffer from selection bias. The parameters that I chose to present here are some of those that showed significant changes over time in some of Zoetis’ clinical trials, although in some cases at different time points than mine. Descriptive findings: There was a slight decrease in the mean WBC count from day 0, but in none of the dogs did the WBC count fall below the reference range. The dog with a WBC count of 25,700 at day 0 had generalized, severe pyoderma, a normal body temperature, and was extremely itchy (pruritus visual analog scale score of 10.0). We elected to continue Apoquel despite the elevated WBCs, as well as cefpodoxime. At his 3 and 6-month examinations, the WBC counts and itch levels were back within normal ranges. 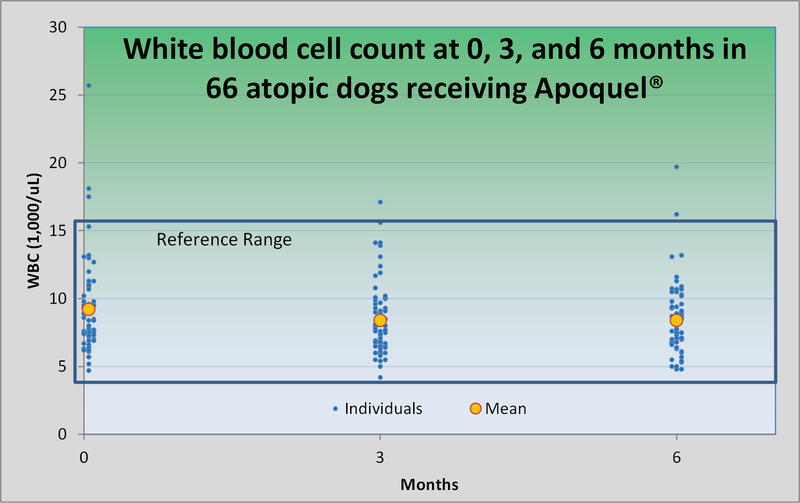 Among individual white blood cell lines, neither mean neutrophil nor mean lymphocyte counts were greatly changed during the 6 months of Apoquel therapy. Next time I’ll present data from these dogs for cholesterol, alkaline phosphatase, and globulin. Have you had a chance to check out Itchology for iPhone? It’s an easy and fun way for dedicated pet owners to chart their dog’s itch level and treatments, set medication reminders, and look for possible causes and effective treatments. Available on the Apple App Store or visit www.itchology.com for a demo video and more information. Atopica® (cyclosporine) and Apoquel® (oclacitinib) are separate and distinct medications. Both are used for controlling the signs and symptoms of atopic dermatitis (“allergies”) in dogs. They are two of the most effective allergy treatments for dogs. Let’s see how they compare. Atopica was FDA approved more than 10 years ago and is widely available as a prescription drug through veterinarians. Apoquel was launched in January 2014, but the demand quickly exceeded the manufacturing capacity of the manufacturer, Zoetis. This has led to very limited availability and backorders. Most veterinary clinics are unable to order any Apoquel at all. Zoetis anticipates that production will be able to keep up with the demand in the spring of 2015. Atopica comes in four sizes: 10, 25, 50 and 100 mg capsules. It is dosed based on your dog’s body weight. Each size is priced differently and larger dogs may require more than one capsule. Depending upon your dog’s weight, the initial cost may range from $1.50-$10 per day. Significant rebate programs are often available when purchases are made through veterinarians (as much as 50% off ) but not through online pharmacies. The cost often goes down over time if the dose is able to be reduced. Apoquel comes in three sizes: 3.6, 5.4, and 16 mg tablets. Dogs less than 90 pounds need only take 0.5 or 1.0 tablet per day, long term. Big dogs will require 1.5 or 2.0 tablets per day. A novel feature of Apoquel is that all three tablets are priced the same. 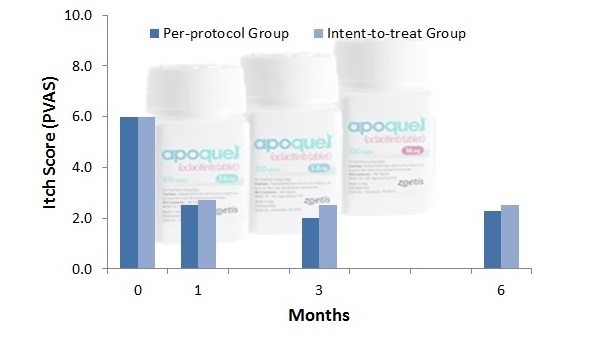 There isn’t much information on the retail pricing of Apoquel available, but it is likely to be around $1.50-$2.00 per tablet in most veterinary hospitals that have it in stock. Atopica comes as capsules, which are fairly large in the 100 mg size. Pet owners often find the larger size difficult to administer. The initial dose is 5 mg per kg body weight. In most cases, it is given once daily for the first month. If your dog responds well, the dose can often be reduced to every 48 hours or even twice weekly. It is then given long-term, or at least during the seasons that your dog itches from allergies. Apoquel comes as scored tablets, which are fairly small and easy to administer. There is a narrow dose range of 0.4-0.6 mg per kg of body weight. Your veterinarian will sometimes need to use half of two different sizes to get the proper dose. For up to 14 days, Apoquel is administered twice daily. In cases of chronic itch in dogs, it is given once daily, long term. Apoquel has a short half-life, meaning that it doesn’t persist for long in the blood stream. Missing even one dose may result in a return of the itching behavior. Establishing a daily routine or setting an iPhone reminder is important. Check out the Itchology app on Facebook, which has a built in medication reminder. Atopica does not usually achieve its maximum effect on itching until after daily dosing for four weeks. Apoquel reduces itching quickly, often within one day. There is a major reduction in itching within 7 days in most dogs. 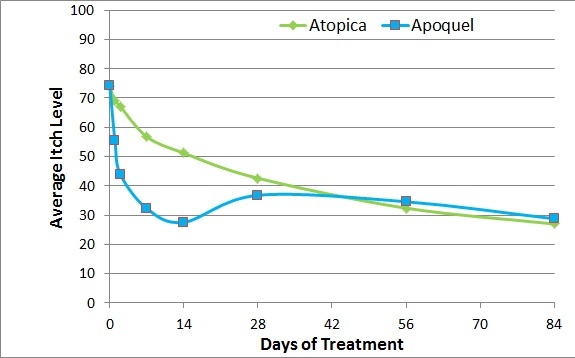 In a head-to-head study, Apoquel reduced the itch level more than Atopica during the first 14 days. There is often a slight increase in itch level when Apoquel dosing is switched from twice daily to once daily, usually at 14 days of therapy. Both Atopica and Apoquel affect the immune system. An allergy is, after all, an overactive immune system. Atopica is considered immunosuppressive, effecting T-cells. Apoquel is considered immunomodulatory, blocking transmission of the itch sensation, among other activities. Both medications have the potential to increase the risk of dogs getting infections. In reality, this is uncommon at recommended doses. In clinical trials, skin infections (pyoderma) do occur, but dogs with allergies often get skin infections whether they are taking one of these medications or not. Atopica is associated with vomiting and diarrhea more often than Apoquel. In a review study compiling results of 672 dogs treated with Atopica, vomiting occurred in 25% and diarrhea or soft stools in 15% of dogs. Usually, veterinarians and pet owners can overcome this, with a slight modification of dosing. Apoquel is uncommonly associated with vomiting or soft stools (1-2% of dogs). In most studies, these occur with a similar frequency in placebo-treated dogs and those treated with Apoquel. Because Apoquel is still relatively new, it is prudent to monitor our patients rather closely. I recommend an examination, complete blood panel and urinalysis at 0, 3, and 6 months, then every 6 months while taking Apoquel, for now. Retrospective evaluation of Apoquel® (oclacitinib) for the treatment of 117 dogs with atopic dermatitis. Part 1: control of pruritus (itch). We started hearing about a new drug to control the itch of allergic dermatitis and canine atopic dermatitis in dogs over 1 year of age at the Vancouver World Congress of Veterinary Dermatology. Like most veterinary dermatologists, I was eager to try it in my practice. I started prescribing (oclacitinib) Apoquel® for itchy dogs at SkinVet Clinic in November 2013. Although there are now several peer-reviewed publications on the safety and efficacy of Apoquel , I would like to share my experience with the first 117 dogs that I treated. The clinical sign of most importance to pet owners of dogs with atopic or allergic dermatitis is pruritus (itch). At SkinVet Clinic, we ask pet owners to grade their dog’s itch level at each examination using a validated visual analog scale (0 – 10). While this is the best method that we have had to grade itch in practice, it gives an incomplete picture of itch severity over time. Soon, pet owners and veterinarians will be able to easily record and view a more complete itch diary using the Itchology app for iPhones (see www.itchology.com for more info and to sign up to get notified when it is released). Figure 1 shows the owner-reported itch level of dogs pre-treatment and at months 1, 3 and 6. Both per-protocol data (dogs returned for recommended follow-up examinations at 1, 3, and 6 months) and intent-to-treat (ITT) data (previous value carried forward when dogs did not return for examinations or medication was discontinued) are shown. 117 dogs started taking Apoquel at least 40 days ago (day 0 median = 6.0). Month 1 itch level scores were available for 104 of these (median = 2.5). The ITT data yielded similar results taking into account carried-forward values for the 13 dogs that did not return (median = 2.7). 108 dogs started taking Apooquel at least 3 months ago (day 0 median = 6.0). Month 3 itch level scores were available for 85 of these (median = 2.0). The ITT value was slightly higher (median = 2.5). 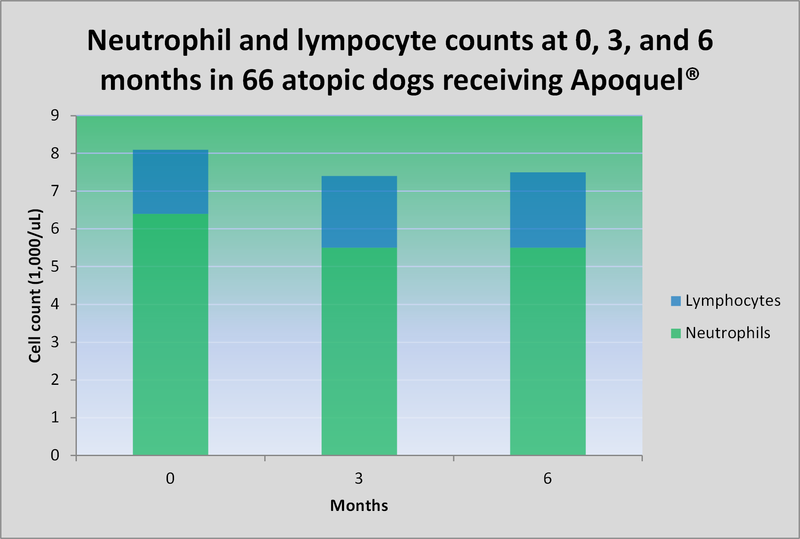 91 dogs started taking Apoquel at least 6 months ago (day 0 median of these 91 dogs = 5.7). Month 6 itch level scores were available for 59 of these (median = 2.3). The ITT value was similar (median = 2.5). The percentage of dogs that achieved a level of itch considered “normal” by dog owners (0.0-1.9) was 36.8% at 1 month, 39.8% at 3 months, and 40.7% at 6 months (based on ITT values). Many others were in the “very mild” itch category. These findings are remarkable, considering that most of the dogs began taking Apoquel during cooler, winter months and follow-up examinations more often occurred during warmer months, when many dogs with allergies would be flaring up. Further, as this was not a rigorous clinical trial, the day 0 itch level was often recorded while the dogs were still taking other medications – from prednisone to Atopica®. (These were discontinued for three days prior to the owner initiating Apoquel, in most cases.) Therefore, it is likely that the day 0 itch level reported here was slightly lower than it would have been with a medication wash-out period. All in all, Apoquel has performed very well in my hands. Take a look at a preview of the app. Sign up to get notified when the app is released at http://www.itchology.com. It will be free for only a short while and available on the Apple App Store in early November. How itchy is your dog, really? 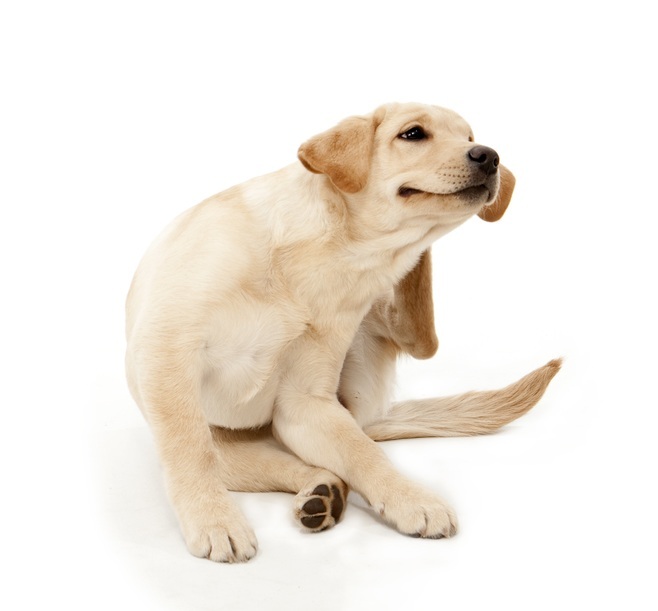 Scratching, biting, chewing, rubbing, and excessive licking can all be signs of itch (pruritus) in dogs. A number of methods have been developed to try to quantify itching, but these are most useful in research settings. One method is to take videos of kenneled dogs, then track all itching behavior seen over a period of time. Another idea that I have published research on is the use of sophisticated motion sensors attached to dogs’ collars. The most widely used method is to ask the dog’s guardian to rate the level of itch severity on a linear scale. Why might measuring itch be important, you ask? I think of it like this: would you start a weight loss program without knowing how much you weigh or put a pet on a diet without recording a body condition score? Excessive itching has a negative impact on dogs’ quality of life. Surprisingly, most veterinary medical record standards do not require us to record itch severity, although it is one of the most common presenting complaints. A meaningful measure of itch severity that dog owners could share with their veterinarian would be a great step forward in helping pet owners participate in the management of their itchy dogs. As a veterinarian that consults primarily on itchy dogs, I would love to have more accurate information about itch severity in my patients. Subscribe to the SkinVet e-Newsletter!